Thousands of believers gather at the outdoor stadium built by Mexico Ministries for ongoing conferences and worship services in Chiapas. "And seeing the multitude, Jesus was moved with compassion..."
That same compassion has led Larry Myers to make it his life's work to bless the people of Mexico through medical ministry, church building, and training pastors. Since Mexico Ministries was founded in 1978, God has used us to establish several medical clinics, build hundreds of church buildings, and train pastors for thousands of believers. Women from the Chamula tribe with blankets gifted to them by supporters of Mexico Ministries. 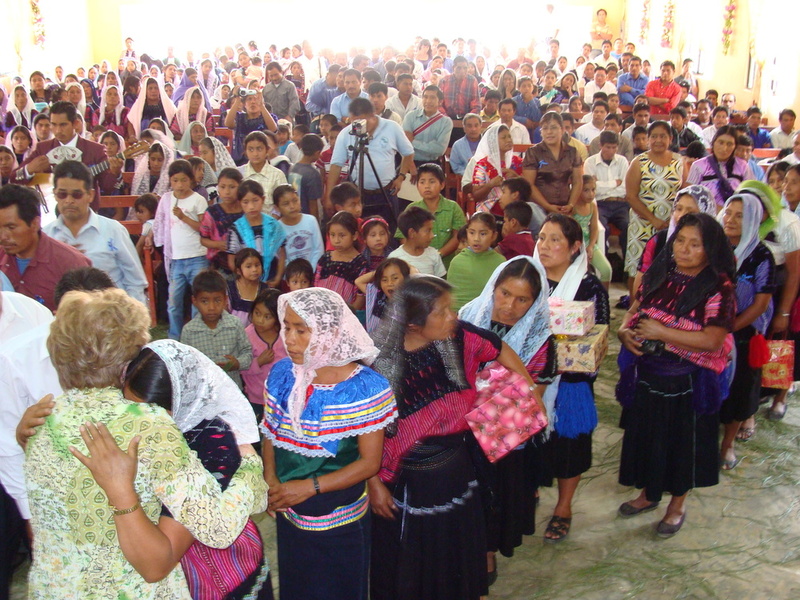 Hundreds gather for worship in Chiapas. A crowd of indigenous mountain people gather at a river for baptism. We are committed to providing enduring places of worship throughout the country, especially for the poor and needy people who without our help would have no place to worship. It is one of our great joys to see these buildings filled to capacity with believers who are eager to gather together to worship God. Larry Myers began working in Mexico while he was still pastoring a congregation in Denison, Texas. Making frequent missions trips, he helped build church buildings throughout the northern part of Mexico. When he finally committed his life to missionary work in 1978 he began working with teams from the United States and Mexico, building churches for congregations from the northern border of the Rio Grande to the southern state of Chiapas, and from one coast to the other. Some of the churches have been large churches in large cities, but the great majority have been small churches in rural or mountain villages, often where the congregation had nothing more than a tree to gather under or a cardboard shack. New congregations are birthed throughout Mexico in a variety of ways. Sometimes it may be a small group of believers banding together to worship without a pastor or a place. More likely it is a pastor with a heart of compassion who goes to a village, brings the Gospel, and gathers believers to worship and grow as disciples. With a two year Bible School program as well as continuing education opportunities and regular conferences, we are committed to raising up and training pastors who will spend their lives in ministry to others. Pastors from throughout the southern state of Chiapas gather in Tuxtla for a conference. Over a hundred pastors gather for worship, training, and mutual edification. Providing life saving and live changing medical care through volunteer healthcare teams, clinics, and staff doctors. Doctors, nurses, surgeons and other medical professionals volunteer their time and talents to provide medical care to the needy in Mexico. Imagine a teenage girl who lived her whole life as an outcast because of a cleft palate that had disfigured her face. Now imagine the miracle of transformation provided by a team of American surgeons offering their skills to the poor in Mexico. Imagine the new opportunities, the new hope, the new life for this young woman. Imagine a mother with a sick child in danger of death because of lack of medical attention. Now imagine a nurse from Louisiana providing the care and medicine needed to save the child's life. Imagine surgeries and medical procedures of every kind being provided to people who would otherwise die. Through medical clinics, a traveling doctor who visits mountain villages, medical campaigns by American doctors and nurses, dental campaigns, and other activities, Mexico Ministries has partnered with professionals in the medical field to extend the healing touch of Jesus to the poor and needy throughout the nation. BEFORE: Young Nabor, born with a cleft palate. DURING: Surgical team from the U.S. performing procedure on Nabor. AFTER: Nabor's life is forever changed. TEN YEARS LATER: Nabor is able to live a full and productive life, thanks to the kindhearted service of volunteer surgeons, doctors and nurses.